Nice crisp pils. Very crushable. Poured from a can into a pint glass. Pours golden yellow with a small white head. Smells of sweet grain. Tastes of sweet grain and slight floral notes. Beer is light bodied and very easy drinking, good carbonation. Overall, an above average beer. appearance: crystal clear and very light golden. the head is very foamy with large bubbles and is a very soft white. it falls quickly to form a nice "lid". smell: initially the smell reminds me of a wiessbier. it's very wheaty, but it has notes of floral hoppiness as well as a hint of biscuit. taste: the hops are much stronger than in the smell, coming off right at the beginning. very floral and almost herb-like, they give a noticeable bitterness to the drink. it's held up strongly by a nice grassy pilsner malt, finishing off with a hint of resin. feel: well-carbonated, light bodied, and refreshing. not too much else to say, it holds pretty true to the pilsner style. overall: a good pilsner but it's a little too hoppy for me. that said, it's a great easily drinkable beer that's good for sipping and quaffing. This is a nice, balanced, easy to drink pilsner and I love the tall boy cans. A little pale and wispy to look at but the odor is stiff with grassy hops and buttered biscuit notes. This isn't a gamechanger like Nugget or Nimble, but a solid, no fuss drinkable brew. Very crisp Pilsner, flavorful and with a peppery bite. On tap at PHI airport. Refreshing. Would have again as a warm weather light option when revisiting the area. 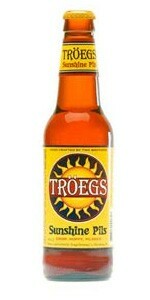 Pounding back the Troegs German style pilsener at the Pirates game at PNC Park in the 'Burgh. Crisp beer for a game and imminently drinkable. Lighter hops used, it comes in at 45 IBUs, so definitely more flavorful and memorable than a typical lager, but there is not really too much about the beer that would make me go out of my way to acquire it. Overall, it is a solid beer that you should grab as a single and try it out. I prefer this to several other pilsners, but I think it is in that middle 68% of the bell curve. Light golden yellow color with white cap. Aroma of mild malt and spicy, floral hops. Rather hop forward on entry (45 IBU) that overshadows the two row malt. Malt presence persists though in a supporting role. I do find the malt has some fullness and just a kiss of sweetness though it finishes dry. Hops are consistent throughout with a spicy firmness that ends on a refreshing note. Overall it's a good take on Pils, or at least an American interpretation of it, that comes across as fairly complex and eminently drinkable.